Do you need dependable and cost-effective roofing in League City, TX? Call ECO Commercial Roofing today at (833) 200-0571 for the top-quality roof services you need! We are experienced in a wide selection of roofing services, and we take client very seriously. We’re participating members of our community, and we have been dependable League City roofers for a long time now. Our roofers are always happy to help our clients with any inquiries or concerns about roof systems, and we supply a selection of solutions too. For professional, kind, and helpful roofers, you can always count on ECO Commercial Roofing! Your roofing plays a significant role in defending your property, so it is of the highest importance that you employ a roofer you can rely on. To provide you with that peace of mind, we utilize high quality materials from Conklin, and we educate each of our roofers to the industry standards. We understand that the roof you pick can impact the value of your property too, so we provide many different roofing varieties for you to choose from. As far as benefits, make sure to consider the longevity and the performance with the same scrutiny that you choose the aesthetics. Your budget should also act as a deciding factor, in addition to the kind of building the roof will be applied to. We have plenty of reliable options to choose from. Reliable roof services are our number one objective, and we can provide that in the form of repairs, replacements, and installations as well. Regardless of what kind of roofing project you need, from commercial, to residential, or even industrial, we have the services you need. Our commercial roof offerings are designed to cater to business owners who have low-sloped or flat roof systems. Ponding and leaking are both common with flat roofs, but an expert installation is the initial step in completely avoiding problems like those. Industrial roofs are similar to commercial roofing, but these roofs require particular installation, along with specific material requirements if you expect them to last long. You can even depend on us for cost-effective home roofing services, designed to serve your home in a variety of ways. 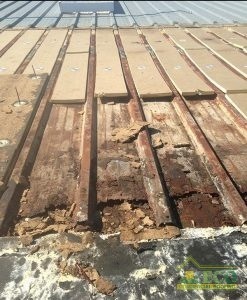 As roofers that specialize in roof restoration, we know more than a few techniques to handle roof coatings. In our experience, using high quality materials like Conklin can really mean the difference between a roof coating that lasts, and one that does not. Our roof services are designed to be some of the greatest roofing in League City, TX, with particular craftsmanship, and impressive customer satisfaction. To learn more about our Conklin roof coatings, or to ask questions about our roofing restoration techniques, give us a ring at (833) 200-0571! If you’re looking to fix minor damages on your building’s roof, as well as to defend it from additional damages, a roofing restoration is a fantastic place to start. Correctly done, one of our Conklin roof restorations can add an extra 10 years to the life of your roof! Save yourself time and money by choosing a reliable roof restoration instead of a roof removal and installation. 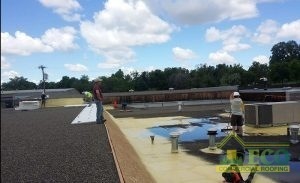 Our roofers typically perform our roof restoration with quality roof coatings by Conklin. You can depend on our contractors to help you determine which of our many roof coating options will work ideally for your needs. Some roof coatings apply to materials such as rubber better than others, and some deliver better moisture resistance for humid climates, so it’s important to choose the right coating with care. In most cases, the roof coating is installed directly to the previous roof’s system. Contact us at (833) 200-0571 today to request an inspection! Elastomeric Roofing Elastomeric roof coatings are available in a variety of kinds, and are an affordable option to protect your roof. Our flat roof services are designed to help out several different styles of commercial roofing, such as low-slope and flat roofs. Keep in mind that your initial line of defense against punctures or early roof failure is a reliable and professional installation. If you want your building’s roof solution to work well, and endure for a long time, our roofers are here to help. ECO Commercial Roofing is the company you can depend on when you require reliable commercial and residential roof services. You can ask for our resilient roofing in League City, TX, and the nearby areas. Your investment in a fortified roof is an investment in your property that you won’t regret! To find out how we can serve you best, give us a call at (833) 200-0571 and schedule your professional roof assessment today!